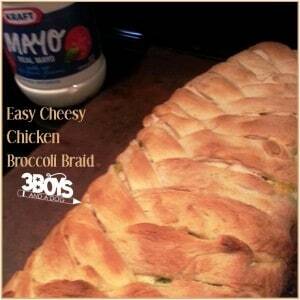 This Chicken Broccoli Braid recipe is a family favorite! I get asked to bring it to all snack-type events from the Super Bowl to the Ornament Exchange party. My recipe specifically calls for Kraft Mayo and Kraft Shredded cheddar. Can you use other bands… I have no clue! My Grandmother uses Kraft, my Mother uses it, and I use it. I have tried the “other” stuff once… it only took once for me to quickly switch back to MY brand. LOL! Looks can be deceiving with this recipe! It takes only minutes to prepared but looks as if it took hours and it is OH SO YUMMY! Bake at 375 degrees for 27 minutes or until the dough is a golden brown. Right now, you can save up to $20 on participating Kraft products, only at Target.